In an era when mass-market cruise ships are getting bigger and bigger, Seven Seas Mariner is a refreshing option that carries only 700 passengers, making for a beautifully intimate sailing with personally tailored service and gorgeous public spaces. While Mariner is an "older" ship by cruise industry standards, it's been impeccably maintained, with major and minor refurbishments over the years; in 2018, it underwent a multimillion-dollar refresh that touched virtually every space. The result is a sleek, modern look throughout the ship -- heavy on polish and marble, yet still warm and comfortable. There's a renewed sophistication, which mimics some of the stylings of Regent's flagship Seven Seas Explorer. It's evident in the light-and-bright public spaces, glass and crystal chandeliers and even a new-to-Mariner restaurant, Chartreuse, which debuted on Explorer. The all-suite ship offers a true luxury experience, where your cruise fare covers virtually everything, including round trip airfare, gratuities, drinks and excursions. This takes almost all the hassle out of sailing; passengers don't have to worry about the cost of a cocktail or how much they should tip cabin stewards. Because of the small size of the ship, it's able to sail into ports its larger brethren can't access, so itineraries offer exotic and unusual ports of call. Regent Seven Seas has made a significant investment in its excursions, and passengers can choose from a wide variety of included options in each port. Excursions are well executed; it's clear they've been vetted well, and they run like clockwork. Most take place in the morning so passengers can enjoy the ship in the afternoon. The ship visits a new port every day -- you won't find sea days on most Mariner sailings -- so onboard activities during the day are pretty light, and many passengers head back to their cabins early at night so they are bright-eyed for the next day's morning excursions. Service and dining on Mariner are key to the experience, and both are generally superior, though uneven in spots. The ship's two specialty restaurants, Prime 7 and Chartreuse, are outstanding when it comes to food, service and overall experience; dining at both is a highlight for any passenger. Yet most passengers are limited to one meal in each, which means diners are rather confined to either Italian venue Sette Mari at La Veranda or Compass Rose, the main dining room (where service is slower), for dinner. What sets apart a sailing on Mariner is the flexibility afforded to each passenger. Kitchen staff will go above and beyond to accommodate dietary needs and preferences, excursions can be individually crafted (for a fee), and room service is as much about culinary experience as it is about convenience. If a passenger has a request for something, the staff will bend over backward to make it happen. This, as much as the ship itself, makes Mariner a joy to sail. 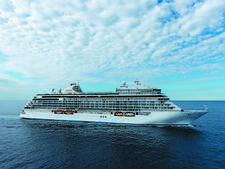 Seven Seas Mariner draws passengers who are well-heeled and well-traveled. 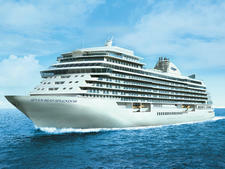 Most are 60 and older, and many are loyal to the cruise line; Regent Seven Seas earns a lot of repeat business. Shorter sailings and those to Alaska tend to draw some younger passengers. You're more likely to see children onboard during the summer, when school is out, but even so, most voyages attract only a handful of passengers sailing with young children. Generally, 80 to 90 percent of passengers are North Americans, but it's not uncommon to see British, German and Australian passengers, too. During the day, passengers on Mariner dress with style: Think country club or high-end resort wear, rather than pool or beachwear. Women opt for capri pants, slacks or jeans with blouses or T-shirts, while men might wear shorts or khakis and collared shirts. Poolside, swimwear is the norm, with the addition of cover-ups and sun hats for women. Bathing suits aren't allowed at indoor venues. At night, after 6 p.m., everyone wears what the line calls "elegant casual," and crew members will politely enforce the dress code, often with a gentle reminder that there is one in place. For ladies, elegant casual means a skirt or dress pants with a blouse or sweater, pantsuit or a dress. Men wear slacks and collared shirts, and while sports jackets are optional, a number of men wear them. In fact, many passengers still put on some pretty fancy clothes ahead of dinner. Jeans, T-shirts, baseball caps, shorts and sneakers aren't permitted in any public area after 6 p.m.
On sailings of 16 nights or longer, passengers will have two formal nights, and they dress to the nines: tuxes or full suits for men, and cocktail gowns, formal pantsuits or dress sets for women. On the final evening of each cruise, when everyone is packing, the dress code is "relaxed casual," a toned-down version of elegant casual, where comfort takes precedence over formality. That said, most passengers adhere to the elegant casual code, even when it's not required. 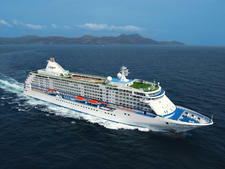 Regent Seven Seas is the most-inclusive cruise line around. 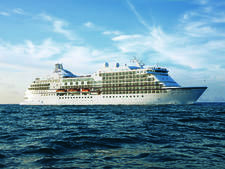 Cruise fares cover all drinks and food, including at least one night in each of the specialty restaurants, gratuities, Wi-Fi, mini-bar stocking and restocking, access to the ship's sauna and steam rooms, shore excursions, airfare and, depending on cabin category booked, butler service, pre-cruise hotel stay and transfers. You'll pay extra for uber-premium spirits and a handful of shore excursions. In the spa, the prices you see include an 18 percent gratuity. Tipping on top of what is included is not required, but it's not uncommon to see passengers slipping their favorite crew members an additional cash gratuity on the final night of the cruise. Regardless of where the ship sails, the U.S. dollar is the onboard currency.